This is a screen shot from Slave Tetris, which I can assure you was a very real mini-game once featured in Playing History 2: Slave Trade. Originally released in 2013, the mini-game has now been removed, following a backlash after the developer promoted a Steam sale. The Playing History series comes from Serious Games, a developer trying to infuse games with the past by “experiencing engaging and personal stories set in exhilarating points in world history.” Slave Trade was the third game in the Playing History series, preceded by Vikings and Plague. How does a game from 2013, which was added to Steam in 2014, cause a controversy in 2015? You can imagine some of the responses to that Tweet, a mixture of outrage, hardline defenses of creative freedom, and people yelling as loudly as possible. It didn’t take long for the backlash to spread, with mainstream outlets like BuzzFeed, ThinkProgress, and the Daily Mail writing stories about the game. This did little to quell anger, since the apology was couched in language that pointed the finger at everyone else, rather than any introspection or reflection by Serious Games. Maybe there is just a lot of culturally differences in what you can discuss and express – and maybe just maybe there are larger issues at stake here then whether slave tetris was bad taste or not… and maybe as a lot of the tweeters say a stupid white dane like me don’t know anything, and shouldn’t be allowed to say a single word about the story of African-Americans. What do I know.. We just tried to make a game to teach about what we thought was an important topic. We did spend a lot time doing it, We did consult with experts. We didn’t set out to make a racist or inflammatory game. Actually the opposite – a game where you would understand slave trade from the inside by escaping slavery… I have reached the conclusion that no matter what we had done it would have been wrong. I think it is a real shame that a lot of people are so ignorant towards the potential of games for more than entertainment. Like any medium or tool it can be used for good or evil. It is our aim to reach people that would normally not reflect or learn about this subject. Furthermore, I have a feeling that many of the negative reactions in here are knee-jerk reactions and sheeps following what other says. Please take time to look at the game before forming your opinion. I grant that the stacking of slaves in Tetris is a borderline example (it makes up about 30 seconds of the entire game) but please allow me to explain the point. 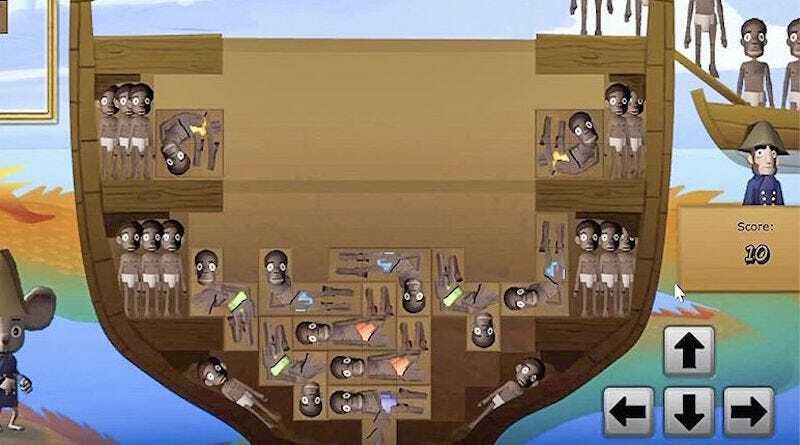 Slave ships was actually almost stacked like you do in Tetris (google stacking slaves, and see the images) as you had to very careful to make the most room to earn as much money as possible - things had to fall into place. As such we try in the game to communicate the absurdity of the past. Our experience is that in the game it really gets people to think about just how absurd and cruel it is - trust me nobody is laughing or finding it a joke to play that kind of Tetris. They do however get a ahaa experience that will indeed haunt them. They will also discuss afterwards, and most of them will probably remember more than did from most their history lessons. Nothing about the game was changed, and when I asked Egenfeldt-Nielsen about why he never considered altering the game’s design, he stood firm. That said, “I have a feeling that many of the negative reactions in here are knee-jerk reactions and sheeps following what other says” is not a terrific way to thoughtfully respond to criticism! He even repeated a version of this line in a follow-up post on the game’s Steam message board. I have not included the random - you are a racist, disgusting, crazy comments, if you can’t see how crazy you are I can’t explain you etc. Lots of people just following like sheep because something on the surface looks wrong. People are so eager to just jump on a wagon. I think the situation we have where people behave this way is far more worrying than any game that could ever be made. We are going towards a closed society, where sensitive and controversial subjects are not welcome in public because it causes an outcry focusing on motives and persons rather than the subject which stops any open debate. When asked, Egenfeldt-Nielsen showed little regret for using the term. In other places, though, he tried to show a little empathy. We decide to remove the slave tetris part. It was clearly a red rag [sic] for a lot people, and it shadowed for the rest of the game. I am surprised it caused such an outcry but have no intention of insulting people that feel so strongly about it. Some players are asking for refunds, since the game’s content has been altered since release, and Egenfeldt-Nielsen said he had no problem with people looking to get their money back.